In my last three posts, I have looked at country risk, starting with measures of that risk and then moving on to valuing and pricing that risk. 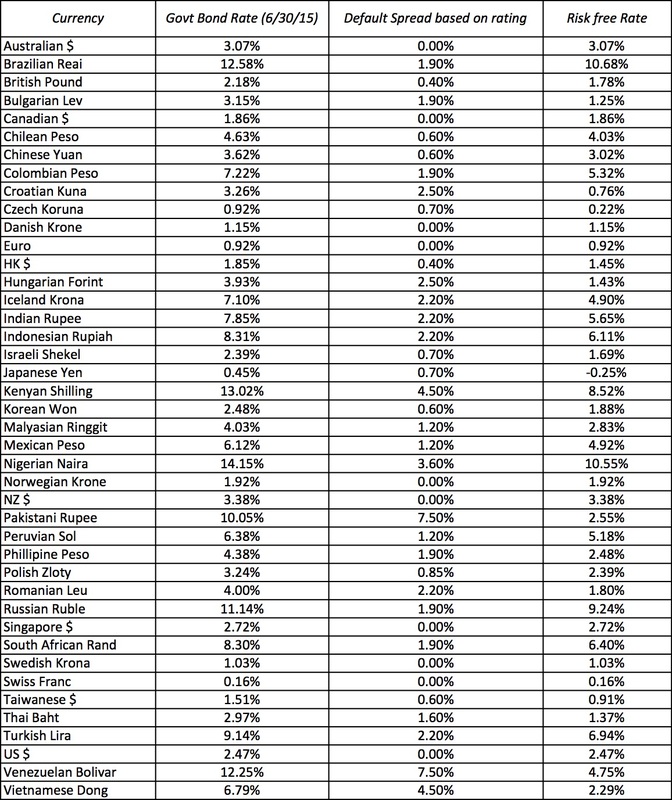 You may find it strange that I have not mentioned currency risk in any of these posts on country risk, but in this one, I hope to finish this series by looking first at how currency choices affect value and then at the dynamics of currency risk. A fundamental tenet in valuation is that you have to match the currency in which you estimate your cash flows with the currency that you estimate the discount rate that you use to discount those cash flows. Stripped down to basics, the only reason that the currency in which you choose to do your analysis matters is that different currencies have different expected inflation rates embedded in them. Those differences in expected inflation affect both our estimates of expected cash flows and discount rates. When working with a high inflation currency, we should therefore expect to see higher discount rates and higher cash flows and with a lower inflation currency, both discount rates and cash flows will be lower. In fact, we could choose to remove inflation entirely out of the process by using real cash flows and a real discount rate. There are two ways in which you can incorporate the expected inflation in a currency into the discount rate that you estimate in that currency. The first is through the risk free rate that you use for the currency, since higher expected inflation should result in a higher risk free rate. The second is by converting the discount rate that you estimate in a base currency into a discount rate in an alternate currency, using the differential inflation between the currencies. A risk free rate is more than just a number that you look up to estimate discount rates. In a functioning market, investors should set the risk free rate in a currency high enough to cover not only expected inflation in that currency but also to earn a sufficient real interest rate to compensate for deferring consumption. The risk free rate should therefore be higher in a high-inflation currency than using that higher rate should bring inflation into your discount rate. 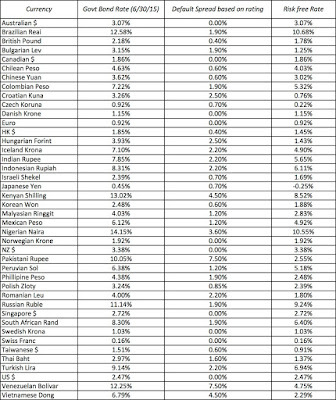 Note that the default spread is set to zero for all Aaa rated governments, and the government bond rate becomes the risk free rate in the currency. Thus, the risk free rates in US dollars is 2.47% and in Swiss Francs is 0.16%. To compute the risk free rate in $R (Brazilian Reais), I subtract out my estimate of the default spread for Brazil (1.90%, based on its Baa2 rating) from the government bond rate of 12.58% to arrive at a risk free rate of 10.68%. To estimate a cost of equity in nominal $R for an average risk company with all of its operations in Brazil, you would use the 10.68% risk free rate in $R and the equity risk premium of 8.82% that I reported in my last post to arrive at a cost of equity of 19.50% in $R. That number would be higher for above-average risk companies, with a beta operating as your scaling mechanism. There are two problems with the risk free rate approach. The first is that it not only requires that you be able to find a government bond rate in the currency that you are working with, but also that the rate be a market-determined number. It remains true that in much of the world, government bond rates are either artificially set by governments or actively manipulated to yield unrealistic values. The second is that you are adding equity risk premiums that are computed in dollar-based markets (since the default spreads that they are built upon are from dollar-based bond or CDS markets) to risk free rates in other currencies. You could legitimately argue that the equity risk premium that you add on to a $R risk free rate of 10.68% should be higher than the 8.82% that you added to a US $ riskfree rate of 2.25% in July 2015. The cost of equity of 19.65% that we derive from this approach is higher than the 19.50% that we obtained from the risk free rate approach and is perhaps a better measure of cost of equity in $R. This approach rests on being able to estimate expected inflation in different currencies, a task that is easier in some than others. For instance, getting an expected inflation rate in US dollars is simple, since you can use the difference between the 10-year T.Bond rate and the TIPs (inflation-indexed) 10-year bond rate as a proxy. In other currencies, it can be more difficult, and you often only have past inflation rates to go with, numbers that are prone to government meddling and imperfect measurement mechanisms. Notwithstanding these problems, I report inflation rates in different countries, using the average inflation rate from 2010-2014 for each country. I also report the inflation rate in 2014 and the IMF expectations for inflation (though I remain dubious about their quality) for each country. Following the currency consistency principle is often easier with discount rates, where your inflation assumptions are generally either explicit or easily monitored, than it is with cash flows, where these same assumptions are implicit or borrowed from others. If you add in accounting efforts to adjust for inflation and inconsistencies in dealing with it to the mix, it should come as no surprise that in many valuations, it is not clear what inflation rate is embedded in the cash flows. Past Growth: With historical growth, where you estimate growth by looking at the past, your biggest exposure to mismatches occur in currencies where inflation rates have shifted significantly over time. For instance, assume that you are valuing your company in Indian rupees in July 2015 and that the average inflation rate in India, which was 8% between 2010 and 2014 is expected to decline to 4% in the future. If you use historical growth rates in earnings, between 2010 and 2014, for an Indian company, you are likely to over value the company because its past growth rate will reflect past inflation (8%) but your discount rates, computed using expected inflation or current risk free rates in rupees, will reflect a much lower inflation rate. Management/Analyst Forecasts: With management or analyst forecasts, the problem is a different one, since the expected inflation rates that individuals use in their forecasts can vary widely. While there is no reason to believe that your estimate of expected inflation is better than theirs, it is undeniably inconsistent to use management estimates of expected inflation for growth rates and your own or the market's estimates of inflation, when estimating discount rates. Fundamental or Sustainable Growth: I believe that the best way to keep your valuations internally consistent is to tie growth to how much a company is reinvesting and how well it is reinvesting. The measures we use to measure reinvestment and the quality of investment are accounting numbers and inflation mismatches can enter insidiously into valuations. Assume, for instance, that you are estimating reinvestment rates and returns on capital for a Brazilian company, using its Brazilian financial statements. Since Brazilian accounting allows for inflation adjustments to assets, the return on capital that you compute is closer to a real return on capital (with no or low inflation embedded in it) than to a nominal $R return on capital, if inflation accounting works as advertised. In countries like the United States, where assets are not adjusted for inflation, you can argue that the return on capital is a nominal number, but one that reflects past inflation, not expected future inflation. In either case, the growth rate that you compute from these numbers will be skewed. It is common practice, in some valuation practices, to forecast cash flows in a base currency (even if it is not the currency that you plan to use to estimate your discount rate) and then convert into your desired currency, using expected exchange rates. Thus, a Brazilian analyst who wants to value a Brazilian company in US dollars may estimate expected cash flows in nominal $R first and then convert these cash flow into US $, using an $R/US $ exchange rate. The big estimation question then becomes how best to estimate expected exchange rates and there are three choices. Use the currency exchange rate: The first one, especially in the absence of futures or forward markets, is to use the current exchange rate to convert all future cash flows. This will result in an erroneous value for a simple reason: it creates an inflation mismatch. If, for instance, the expected inflation rate in $R in 9.5% and in US$ is 1.5%, you will significantly over value your company with this approach, because you have effectively built into a 9.5% inflation rate into your cash flows (by using a constant exchange rate) and a 1.5% inflation rate into your discount rate (since you are estimating it in US dollars). Use futures and forward market exchange rates: This is more defensible but only if you then extract risk free rates from these same futures/forward market prices. (This will require that you assume interest rate parity in exchange rates and derive the interest rate in $R from the $R/US$ forward rate). In addition, in many emerging market currencies, the forward and futures markets tend to be operational only at the short end of the maturity spectrum, i.e., you can get 1-year forward rates but not 10-year rates. Use purchasing power parity: With purchasing power parity, the expected exchange rates are driven by differential inflation in the currencies in question. Thus, if purchasing power parity holds and the inflation rates are 9.5% in $R and 1.5% in US$, the $R will depreciate roughly 8% every year. While I am sure that you can find substantial evidence of deviation from purchasing power parity for short or even extended periods, here is why I continue to stick with it in valuation. By bringing in the differential inflation into both your cash flows and the discount rate, it cancels out its effect and thus makes it less critical that you get the inflation numbers right. Put differently, you can under or over estimate inflation in $R (or US $) and it will have no effect on your value. Inflation inconsistencies: It is stemming from inconsistencies in the way that you have dealt with inflation in different currencies, since a company's value should come from its fundamentals and not from which currency you chose to evaluate it in. Currency views: You have built in a currency view into your company valuation. Thus, if you assume that the $R will strengthen against the US dollar in the next 5 years, when estimating cash flows, notwithstanding the higher inflation rate, you will find your company to be under valued, when you value it in $R. If that is the case, my suggestion to you would be to just buy currency futures or options, since you are making a bet on the currency, not the company. The bottom line is that your currency choice should neither make nor break your valuation. A well-run company that takes good investments should stay valuable, whether I value it in US dollars, Euros, Yen or Rubles, just as a badly run or risky company will have a low value, no matter what currency I value it in. When working with cash flows in a foreign currency, it is understandable that analysts worry about currency risk, though their measurement of and prescriptions for that risk are often misplaced. First, it is not the fact that exchange rates change over time that creates risk, it is that they change in unexpected ways. Thus, if the Brazilian Reai depreciates over the next five years in line with the expectations, based upon differential inflation, there is no risk, but if it depreciates less or more, that is risk. Second, even allowing for the fact that there is currency risk in investments in foreign markets, it is not clear that analysts should be adjusting value for that risk, especially if exchange rate risk is diversifiable to investors in the companies making these investments. If this is the case, you are best served forecasting expected cash flows (using expected exchange rates) and not adjusting discount rates for additional currency risk. It is true that currency and country risk tend to be correlated and that countries with high country risk also tend to have the most volatile currencies. If so, the discount rates will be higher for investments in these countries but that augmentation is attributable to the country risk, not currency risk. It is easy to get entangled in the web of currency effects and lose sight of your quest for value, but here are few rules that I think may help you avoid distractions. Currencies are measurement mechanisms, not value drivers: As I write this post, it is a hot day in New York, with temperatures hitting 95 degrees in fahrenheit. Restating that temperature as 35 degrees celsius may make it seem cooler (it is after all a lower number) but does not alter the reality that I will be sweating the minute that I step out of my office. In the same vein, if I value an Argentine company in a risky business, converting its cash flows from Argentine pesos to US dollars will not make it less risky or less exposed to Argentine country risk. Pick a currency and stick with it: The good news is that if your valuations are currency invariant, all you have to do is pick one currency (preferably one that you are comfortable with) and stick with it through your entire analysis. Separate your currency views from your company valuations: It is perfectly reasonable to have views on currency movements in the future but you should separate your currency views from your company valuations. If you do not, it will be impossible for those using your valuations to determine whether your judgments about valuation are based upon what you think about the company or what you feel about the currency. It is this separation argument that is my rationale for sticking with much maligned purchasing power parity in estimating future exchange rates. You can run, but you cannot hide: If inflation is high and volatile in your local currency, it is easy to see why you may prefer working with a different, more stable currency. It is the reason why so much valuation and investment analysis in Latin America was done in US dollars. The bad news, though, is that while switching to US dollars may help you avoid dealing with inflation in your discount rate, you will have to deal with it in your cash flows (where you will be called upon to forecast exchange rates). In my last two posts, I looked at country risk, starting with an examination of measures of country risk in this one and how to incorporate that risk into value in the following post. In this post, I want to look at an alternative way of dealing with country risk, especially in investing, which is to let the market price of country risk govern decisions. If you are not a believer in discounted cash flow valuations, I understand, but you still have to consider differences in country risk in your investing strategies. If you use pricing multiples (PE, Price to Book, EV to EBITDA) to determine how much you will pay for companies, you could assume that the levels of these multiples in a country already incorporate country risk. Thus, you are assuming that the PE ratios (or any other multiple) will be lower in riskier countries than in safer ones. The PE ratio that you should expect to observe in a country will be a function of the efficiency with which firms generate earnings (measured by the payout ratio), the expected growth in these earnings (g) and the risk in these earnings (captured by the cost of equity). Holding the growth and earnings efficiency constant, then, you should expect to see lower PE ratios in countries with higher risk and higher PE ratios in safer countries. You can use the same process to extract the determinants of price to book ratios or enterprise value multiples and you will arrive at the same conclusion. To see how well this pricing paradigm works, I started by looking at PE ratios by country in July 2015. To estimate the PE ratio for a country, I tried three variants. In the first, I compute the PE ratio for each company in the country (where it was computable) and then average across these PE ratios. To the extent that there are small companies with outlandish PE ratios in the sample (and there are many), these ratios will be skewed upwards. In the second, I compute a weighted average PE ratio across companies, with the weights based upon net income. This ratio is less affected by outliers, but it excludes money losing firms (since the PE ratio is not meaningful for these companies). In the third, I add up the market values of equity across all companies in the market and divide by aggregated net income for all companies, including money losing companies, i.e., an aggregated PE ratio. This ratio has the advantage of including all listed firms in a market but big money losing firms will push this measure up. The picture below summarizes differences in PE ratios across the world, with the weighted average PE ratio as the primary measure, but with the all three reported for each country. As you can see PE ratios are noisy, with some very risky countries (like Venezuela) trading at high PE ratios and safe countries at lower values, not surprising given how much earnings can shift from year to year. For the most part, the riskiest countries are the ones where stocks trade at the lowest multiple of earnings. Looking at this map, it is quite clear that there is much less correlation between EV/EBITDA multiples and country risk than there is with the equity multiples. While it is true that the lowest EV/EBITDA multiples are found in the riskiest parts of the world (Russia & Eastern Europe, parts of Latin America and Africa), the highest EV/EBITDA multiples are in India and China. There are two ways of looking at these results. The optimistic take is that if you have to pick a multiple to use compare companies that are listed in different markets, you should use an enterprise value multiple, since it is less affected by country risk. The pessimistic take is that you are likely to over value emerging market companies, if you use EV/EBITDA multiples, since they are less likely to incorporate country risk. Compare how stocks listed in a country are priced to find “bargains”: You could compare PE ratios across Brazilian companies on the assumption that Brazilian country risk is already incorporated in the pricing and buy (sell) the lowest (highest) PE stocks. The danger with this approach is that you are assuming that all Brazilian companies are equally exposed to Brazilian country risk. Compare how stocks within a sector in a country are priced: Rather than compare across all stocks in a market, you could compare stocks within a sector in that market, on the assumption that both country and sector risk are already in the prices. Thus, you could compare the EV/Sales ratios of Brazilian retailers and argue that the retailers that trade at the lowest multiples of revenues are cheapest. The downside is that you may not find enough companies in a country, especially in a smaller market. Compare how stocks within a sector are priced globally: A logical outgrowth of globalization is to compare companies within a sector, even if they are listed in different countries. Thus, you could compare Vale to other mining companies listed globally and Coca Cola to beverage companies across countries. The benefit is that you have more comparable firms but the danger is that you are ignoring country risk. Compare stocks within a sector are priced globally, but control for country risk: In this last approach, you look at the pricing of companies across a sector but try to control for country risk by looking at differences between how the market is pricing companies in developed markets and emerging markets. No matter which approach you use, you have the pluses and minuses of pricing. The plus is that you will always be able to find "cheap" stocks, because you are making relative judgments and it is simple to get the data. The minus is that if stocks are collectively over priced, either at a country or sector level, a pricing comparison will just yield the least over priced stock in the country or sector. In my last post, I looked at ways in which you can try to incorporate country risk into the values of companies. In this one, I looked at how price these companies, based upon how the market is pricing other companies in risky countries. As I have argued in my posts on price versus value, the two approaches can yield divergent numbers and conclusions. Thus, you could value a company with all its operations in China, using an appropriate equity risk premium for China, and conclude that the stock is over valued. You could then compare the PE ratio for the same company to the PE ratio for the Chinese market and decide that it is cheap, because it trades at a lower multiple of earnings than a typical Chinese company. I tend to go with the first approach, since I have more faith in my valuation abilities than in my pricing abilities, i.e., I am more investor than trader. However, I am not quick to dismiss those who use pricing metrics to pick investments, since a nimble trader can play the pricing game very profitably. If you are unsure about where you fall in this process, I would suggest that you both value and price companies and buy only when both signal that the stock is a bargain. In my last post, I looked at the determinants of country risk and attempts to measure that risk, by risk measurement services, ratings agencies and by markets. In this post, I would first like to focus on how investors and business people can incorporate that risk into their decision-making. In the process, I will argue that while it is easy to show that risk varies across countries, significant questions remain on how best to deal with that risk when making investment and valuation judgments. If the value of an asset is the risk-adjusted present value of its expected cash flows, it stands to reason that cash flow claims in riskier countries should be worth less than otherwise cash flow claims in safer parts of the world. This common-sense principle, though, can be complicated in practice, because there are two ways in which country risk can flow through into value. Adjust expected cash flows: The first is to adjust the expected cash flows for the risk, bringing in the probability of an adverse event occurring and computing the resulting effect on cash flows. In effect, the expected cash flows on an investment will be lower in riskier countries than an otherwise similar investment in safer countries, though the mechanics of how we lower the cash flows has to be made explicit. Modify required return: The second is to augment the required return on your investment to reflect additional country risk. Thus, the discount rate you use for cash flows from an investment in Argentina will be higher than the discount rate that you use for cash flows in Germany, even if you compute the discount rate in the same currency (US dollars or Euros, for instance). The question of whether there should be an additional premium for exchange rate risk is surprisingly difficult to answer, though I will give it my best shot later in this post. While both processes are used by analysts, the adjustments made to cash flows and discount rates are often arbitrary and risk is all too often double counted. The questions of which types of risks to bring into the expected cash flows and which ones into discount rates but also how to do so remain open and I will lay out my perspective in this post. If there is a probability that your business can be adversely impacted by risk in a country, it stands to reason that you should incorporate this effect into your expected cash flow. There are three ways that you can make this adjustment. Probabilistic adjustment: The first is to estimate the likelihood that a risky event will occur, the consequences for value and cash flow if it does and to compute an expected value. 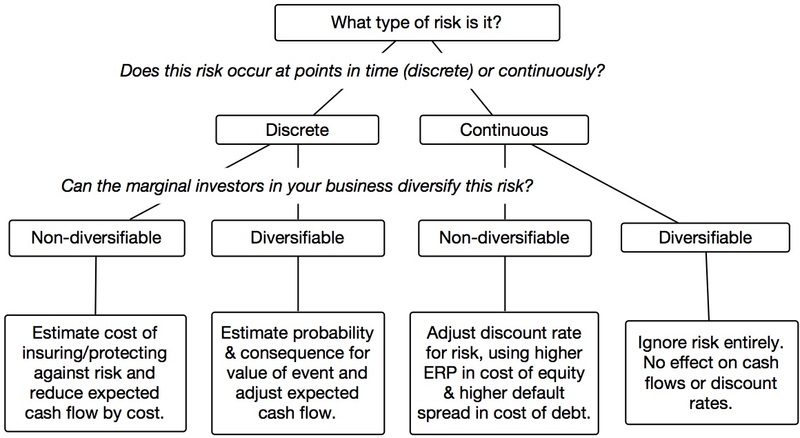 This is the best route to follow for discrete, country-specific risks that can have large or catastrophic effects on your business value, since discount rates don't lend themselves easily to discrete risk adjustment and the fact that the risk is country-specific suggests that globally diversified investors may be able to diversify away some or much of the risk. A good example would be nationalization risk in a country prone to expropriating private businesses, where bringing in its likelihood will lower expected earnings in future periods and cash flows. Build in the cost of protection: The second approach is to estimate the cost of buying protection against the country risk in question and bring in that cost into your expected cash flows. Thus, if you could buy insurance against nationalization, you could reduce your expected earnings by that insurance cost and use those earnings as a basis for estimating cash flows. This approach is best suited to those risks that can be insured against either in the insurance or financial markets. It is also my preferred approach in dealing with corruption risk, which, as I have argued in a prior post, is more akin to an unofficial tax imposed on the company. Cash flow hair cuts: The third way to adjust for country risk is to lower expected cash flows in risky countries 10%, 20% or more, with the adjustment varying across countries (with bigger hair cuts for riskier countries) and analysts (with more risk averse analysts making larger cuts). The perils of this approach are numerous. The first is that it is not only arbitrary but it is also specific to the individual making it, causing it to vary from investment decision to decision and from analyst to analyst. The second is that, once made, the adjustment is hidden or implicit and subsequent decision makers may not be aware that it has already been made, resulting in multiple risk adjustments at different levels of the decision-making process. 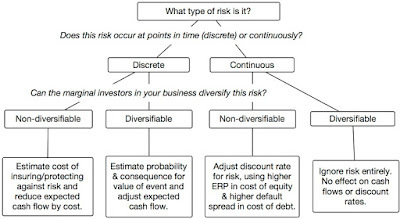 A key distinction between the first approach (probabilistic) and the other two (building in cost of insuring risk or haircutting cash flows) is that taking into account the probability that your business could be adversely impacted by an event and adjusting the expected cash flows for the impact does not "risk adjust" the cash flows. You will attach the same value to a risky business as you would to a safe business with the same expected cash flows. The second approach to dealing with country risk is to adjust discount rates, pushing up the required returns (and discount rates) for investments made in riskier countries. Those higher rates will push down value, thus accomplishing the same end result as lowering expected cash flows. With fixed income claims (bonds, financial guarantees), this is easy enough to do, requiring an additional default spread (for country risk) in the desired interest rate, which, in turn, will lower value. In my last post on country risk, I looked at measures of sovereign default risk including sovereign ratings and credit default swaps. If you have a fixed cash flow claim against a sovereign, you could use these default risk measures to calculate the value of these claims. Thus, if the sovereign CDS spread for Brazil is 2.91% and the risk free rate in US dollars is 2.47%, you would price Brazilian dollar denominated bonds or fixed obligations to earn you 5.38%. 1. Company Rating: Just as ratings agencies and CDS markets estimate default risk in sovereigns, they also estimate default risk in some companies, especially larger ones. If your fixed cash flow claim is against a company where one or both of these are available, you can use them to compute an expected return (and discount your fixed claims at that rate). To illustrate, Vale, a Brazilian mining company, has a bond rating of Baa2 from Moody's in July 2015, and the default spread for a Baa2 rated bond rated bond is 1.75%. Since ratings agencies already incorporate (at least in theory) the fact that Vale is a Brazilian company into the bond rating, there is no need to consider country risk. To illustrate, I estimated a synthetic rating of AAA for Bajaj Auto, an Indian auto manufacturer. To get Bajaj Auto’s cost of debt in US dollars, I would add the default spread based on this rating (0.40%) and the default spread for India (2.20%) to the US dollar risk free rate (2.25%), yielding a composite value of 4.65%. For larger companies with some or a great deal of global exposure, it is possible that only a portion of the country default spread will apply. When valuing equity claims, the process of adjusting for country risk becomes more complicated. First, since equity claim holders don't get paid until the fixed cash flow claims have been met, they face more risk and should demand higher rewards for bearing that risk. Second, since equity investors can diversify away some risks, it is possible for a global investor to be exposed to these risks at the country level and still not demand a higher required return for these risks. Thus, if you are augmenting your required returns for country risk, you are arguing that some country risk is not diversifiable to the investors pricing the company exposed to that risk either because they don't have the capacity to diversify away that risk (by holding a globally diversified portfolio) or because there is correlation across countries that results in even globally diversified portfolios continuing to be exposed to country risk. Third, a multinational company is exposed to risky in many countries and not just to the risk of the country in which it is incorporated. Consequently, you have to separate the estimating of risk premiums for countries from that of risk premiums for companies. The standard deviations of the Bovespa (20.25%) and the Brazilian government bond (12.76%) are used to scale up the default spread to yield an equity risk premium of 8.82%. The standard practice in valuation is to look at a company's country of incorporation and assign an equity risk premium to it, based on that choice, a practice that has its roots in simpler times when much or all of most companies' revenues came from domestic markets and where multinationals were the exception, rather than the rule. Revenues: To the extent that your revenue stream is dependent upon the economic health of the country from which it is derived, you could argue that it is revenue that you should be focusing on. EBITDA or Earnings: Since value is a function of cash flows (and not revenues), you may be inclined to use the EBITDA, by region, to weight equity risk premiums. There are three concerns you should have, though. The first is that many companies don't break down EBITDA, by region, while most break down revenues globally. The second is that accounting judgments come into play when assessing earnings by region, since expenses have to be allocated across regions. Much as we would like to believe that these allocations are driven by economic fundamentals, it is undeniable that tax considerations play a role. Third, unlike revenues which are always positive, the EBITDA for a region can be negative and it is not clear how you deal with negative weights. Assets: If you are an asset-based company (real estate or hospitality), your primary exposure to country risk may be at the asset level, and your most logical basis for computing an equity risk premium is to weight it based on assets. As with earnings, companies are not always forthcoming breaking down assets and even when broken down, the reported values tend to be book values (rather than market values). Production: In some cases, your primary exposure to risk may be to your operations rather than your revenue streams. In other words, if country risk leads you to shut down your factories, refineries or mines, it does not matter where you generate your revenues. Thus, with natural resource companies and companies that require significant infrastructure investments, you may choose to weight based upon where your production is centered. This is rarely reported in full in most company financials, though you may be able to guess, if you are familiar with the company. To illustrate, Coca Cola, while headquartered in the United States, has revenues across much of the globe and its 2014 annual report breaks revenues down into geographical regions. Using that revenue breakdown with the weighted ERP of each region from the last section, we estimate an equity risk premium of 6.90% for Coca Cola. Consider Vale, a commodity company, instead. Its revenue breakdown on 2014 is below, with a weighted equity risk premium of 7.39% for the company. As you can see, Vale is more exposed to Chinese country risk than Brazilian country risk, at least based on revenues. As a commodity company, you could argue that some of Vale's risks come from where its iron ore/mining reserves lie and that the equity risk premium should reflect that at as well. I agree, but Vale is still surprisingly opaque when it comes to the geographical breakdown of its operations. Since country risk can take many different forms and the way you should deal with it varies widely depending on that form, the picture below is designed to capture how best (at least from my perspective) to incorporate risk into value. There are three keys to dealing with country risk. Look at country risk through the eyes of investors in your company: Many businesses, when looking at country risk, tend to look at how exposed they are to the risk, when they should be looking at risk exposure through the eyes of their investors. Make your risk adjustment(s) transparent: Whatever adjustment you make for country risk, it should be transparent. Put differently, if you adjust discount rates for country risk, your country risk adjustment should be visible to others who may look at your valuation. In far too many valuations, the adjustments for country risk are implicit, thus making it impossible for others to understand the adjustments or take issue with them. Do not double count or triple count risk: In a surprisingly large number of valuations, risk is double counted. Thus, it is not uncommon to see government bond rates that are not risk free being used as risk free rates, multiple hair cuts to the same cash flows and the same risk being adjusted for in both the cash flows and discount rate. One of the key requirements in operating a business globally is understanding how risk varies across countries and incorporating those risk assessments into whether and where you invest your (or your business) money. In these last two posts, I have tried to provide my perspective on both measuring risk differences across countries and how I think this risk should enter your investment decisions. It is true that both posts have avoided the questions of how the market prices these risks and of how currency risk enter the process, which you may view as glaring omissions, I will deal with the pricing question in my next post and look at decoding the currency puzzle in my last one. It’s been an eventful few weeks. Greece’s extended dance with default has left even seasoned players of the European game exhausted and hoping for a resolution one way or the other. In Latin America, Brazil’s political and business elite are in the spotlight as the mess at Petrobras spreads its poisonous vapors. On the other side of the world, the Chinese government, which finds markets useful only when they serve its purposes, is trying to stop a full fledged rout of its equity markets. For investors everywhere, the events across the world, discomfiting though they might be, are reminders of two realities. The first is that globalization, while bringing significant benefits, has created connections across markets that make any country's problem a global one. The second is that notwithstanding this globalization, some parts of the world are more prone to generate political and economic surprises than others. As companies and investors are forced to look outside their borders, I thought it would be a good time to examine how and why risk varies across countries and at updated measures of that risk. There is risk in every market for investors and businesses, but some countries are more exposed to risk than others. While there are few people who would contest this notion, I think it is still worth examining the drivers of country risk as a prelude to measuring it. Broadly speaking, these drivers can be broken down into political, legal and economic groupings. Stage in Development Life Cycle: When looking at companies, it is generally true that companies early in their life cycles, with evolving markets and business models, will be more volatile and risky than companies that are further alone in the life cycle. The same concept can be extended to countries, with emerging market economies, exhibiting higher growth and more uncertainty than more mature economies. Economic concentration: Countries that are dependent upon one or a few commodities or industries for growth will have more economic volatility than countries with diversified economies. In particular, smaller countries (and economies) are more likely to face this problem since their small sizes require them to find niches in the global economy and specialize. In the map below, I report concentration measures for countries estimated by UNCTAD to capture this dependence, with high values correlating to more concentrated economies (and higher risk) and lower values to more diversified economies. 1. Continuous versus Discontinuous Change: The debate about whether risk is higher or lower in democracies or autocracies is an old one and one that is sure to evoke a heated response. On the one hand, democracies create more continuous change, where newly elected governments often feel few qualms about replacing policies that were put into place by prior governments, than autocracies, where governments can promise and deliver stability. However, change in an autocracy, while less common, is also more likely to be wrenching and difficult to plan for. 3. Physical Violence: Operating a business exposes you not only to economic risk but physical risk in some countries, as war, violence and terrorism all wreak havoc. The extent of this danger varies across the world and the map below reports on a violence measure developed by the Institute forPeace and Economics. 4. Nationalization/Expropriation Risk: While less prevalent than it was a few decades ago, it is still the case that businesses in some countries are more exposed to the risk of being nationalized or having assets expropriated by the government, acting in the “national” interest. Given that economic, political and legal risk can vary across countries, it is no surprise that investors and businesses seem out measures of country risk that they can use in decision making. We look at three variants of these measures below. With country risk scores, a service weights (subjectively) the importance of each of the many determinants and comes up with a score for country risk. While there are many services that attempt to do this, the picture below uses the scores from Political Risk Services (PRS) to map out hot spots in the globe. Euromoney, The World Bank and the Economist also have country risk scores but the problem with these scores is three fold. The first is that many of them are intended for general use, rather than for businesses. The second is that there is no standardization in the process; thus, a high score is a reflection of low risk in the PRS system but of high risk in the Economist. Finally, the scores themselves are more rankings than true scores; thus a country with a PRS risk score of 80 is not twice as safe as a country with a PRS risk score of 40. The most widely used measures of country risk are those that try to capture the risk that the country’s government will default on its obligations. While this is undoubtedly a much narrower measure than the political/economic risk scores described in the last section, it is more focused and easily usable in businesses. While ratings are easy to get (and costless for the most part) and can be easily converted into default spreads that can be utilized as risk premiums, ratings measure only default risk, can be erroneous and often reflect risk changes with a lag. b. Credit Default Swaps (CDS): In the last decade, the credit default swap market, which I described in this post, has provided updated, market-driven estimates of default risk. In July 2015, there were 62 countries with default risk measures available on them and the map below provides those market judgments. Credit default swaps are more likely to reflect real world concerns in a timely fashion, but as with any market-driven numbers can also be volatile and prone to over reaction. It is a cliché to state that the world is full of risk and that risk exposure varies across countries and time, but it is critical that investors and businesses make their best efforts to measure these risks and bring them into their decisions. In the next post, I will look at bringing the risk measures (country risk scores, ratings and CDS spreads) into investment and valuation decisions and also at how the market is pricing these risk measures in equity markets today. If you are interested in exploring this topic in more detail, you are welcome to download and read my paper on country risk.